The Governing Body of a Voluntary Aided School plays a fundamental part in its way of life. The governing body employs the staff and admits the students. It has important responsibilities for the curriculum, especially religious education, and for student progress; and it ensures that financial management is sound. 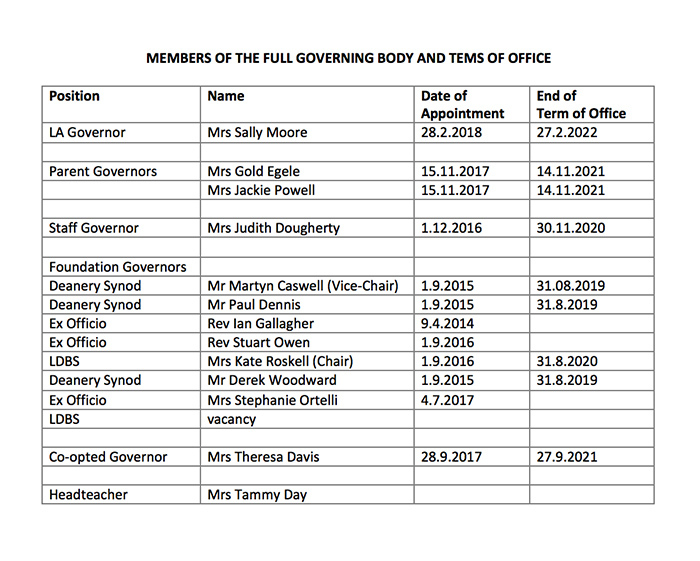 Our Governing Body, set up according to the Instrument of Government 2014, comprises 14 members whose names are listed below. Governors come from many walks of life, including the church, higher education, industry, business and finance. Among their number are elected representatives of the parents and staff. Members serve on the official committees of the governing body and attend school events. As part of their overall concern for the students they have taken out an insurance policy to cover sports injuries, but they would remind parents that there is no insurance cover for personal effects damaged or stolen on the School premises. In an Aided School the Governors, in addition to contributing 10% of the cost of new buildings, have the responsibility for the maintenance and repair of the outside of all their buildings. Parents are encouraged and expected to make an annual contribution (£60 per student) to help keep the buildings in a good state of repair, they are also invited to increase the value of their contribution through the “Gift Aid” scheme at no extra cost to themselves. The response has always been most positive, and consequently the school is a very pleasant place in which to work. BSS GB Annual Statement 2017.18.